Diplocyclos palmatus (L.) C. Jeffrey is a slender, much-branched climber, perennial, with stems up to 6 m long. Leaves simple, alternate, 5 lobed, smooth to hairy above, pale and smooth beneath, margins irregularly toothed, with unpleasant odour when crushed. Flowers white to yellowish, unisexual, male flowers in small fascicles and females flowers solitary. It flowers from March to April. 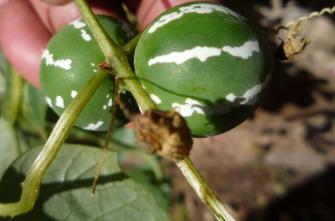 Fruit green with white longitudinal stripes, which become brightly red to orange with maturity. Lollypop climbers are native to Australia, Malaysia, Papua New Guinea and Tropical Africa. It is largely distributed in warmer rain forests. 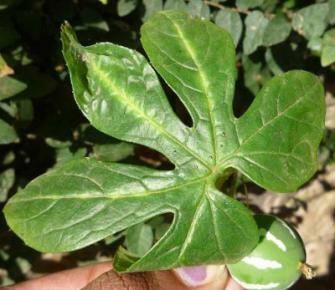 It has been recorded in India as growing and spreading in the wild. Lollypop climber spreads mainly by seeds. This species was probably introduced into South Africa as a garden ornamental because of its decorative fruits. It has been recorded in KwaZulu-Natal at Kloof Memorial Park and Edgecliff Nature Reserve in Pinetown. Lollypop climber invades a variety of habitat types, e.g. forests and floodplains, where it threatens native vegetation. There are no herbicides registered for this species in South Africa. It can be controlled physically by hand pulling, preferably before seeding. What you can you do to help? 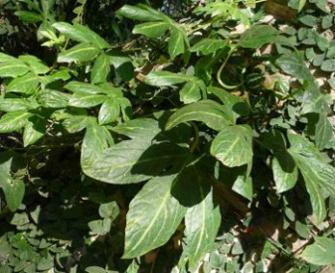 Report sightings of these plants to the Invasive Species Programme at SANBI. We will need to know its locality (the exact locality, supply any landmarks of GPS information if possible). New South Wales Flora on line. Diplocyclos palmatus (L.) Jeffrey. Bosch, C. H. 2004. Diplocyclos palmatus (L.) C. Jeffrey. In: Grubben, G.J.H. and Denton, O. A. PRORA 2: Vegetables/Ledumes. PROTA, Wageningen, Nertherlands.